Trying to work out what to do in Chiang Mai with your limited time? I can’t blame you, there are so many things to do in Chiang Mai and everyone has different recommendations that aren’t catered for you. This list is broken down into four categories to give you a head start on planning your trip to Chiang Mai. Ever since my first visit to Chiang Mai in September 2012 I’ve kept returning. The passport looks like I’m just a little obsessed with the country. With no shortage of things to do in Chiang Mai, can you really blame me? If you haven’t been to Thailand before, remember, Thailand is the land of smiles and many of the locals run on ‘Thai time’. This can be mega frustrating. Try not to get upset about missing out on anything as there are so many other things to do in Chiang Mai every day of the week. Click on the links below to jump right to the category. Related Post: Where To Stay In Chiang Mai? 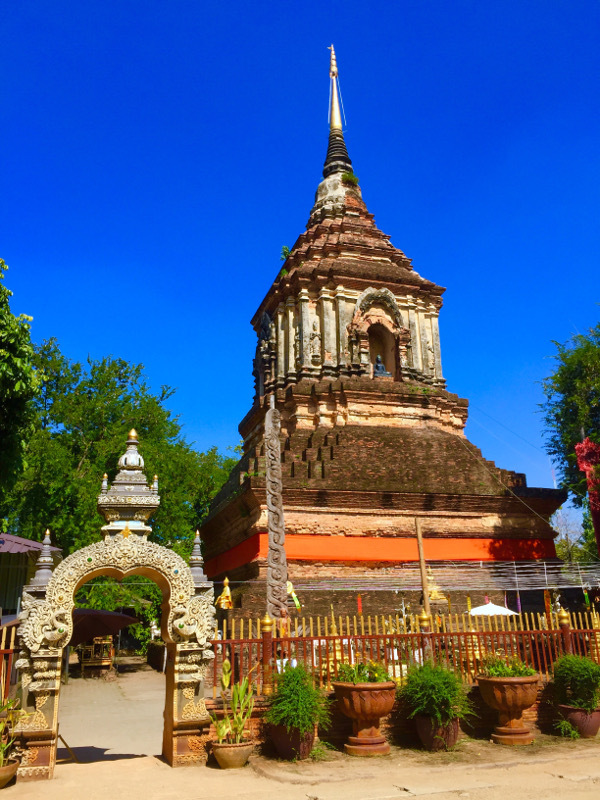 Chiang Mai is home to 100’s of temples. If this is your first stop in Thailand spend a few hours around the old city checking out the best temples in Chiang Mai. If you’ve been elsewhere in Thailand you might be like a lot of others and are starting to get all templed out, in which case don’t make it a ‘must do’. My top 3 personally are: Wat Umong, Wat Phra Singh, and Wat Lok Molee. You can find a few Wats to explore here, here & here, or if you’d like an in depth tour, book this half day tour with a guide. 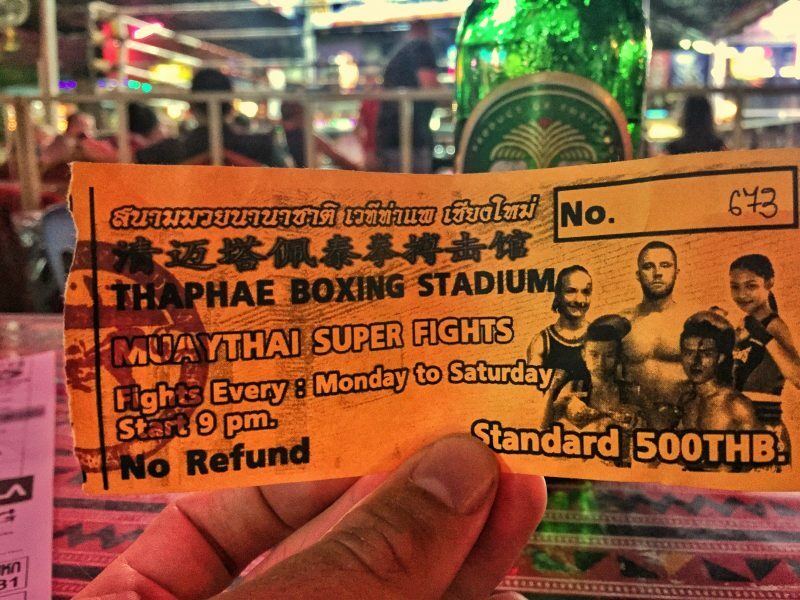 If you aren’t an exercise/sports person you can get a taste of Muay Thai most nights of the week at the local stadiums near the moat. The fights are of varying quality but you normally can get a few good competitive bouts. To find out what’s on, simply hang around the Thaepae Gate area around 5-6pm and soon enough you will see guys hanging out flyers. Pick one up and go from there. It doesn’t matter what day of the week, there should be some kind of event on that may interest you. The expat community in Chiang Mai is thriving, attend a few events and before you know it you will be making friends from all corners of the globe. I’ve been to the cabaret a few times, it’s impressive and a wee bit easier to digest than a Ping Pong Show. If you go to the Night Bazaar, you’ll be able to get directed to the cabaret. The performers are pretty darn good. Heads up, if you are a guy sitting up towards the front you may well get chosen to go up on stage for some fun. Embrace it. The 350 baht entrance includes a free drink. When I visited Chiang Mai the first time I did sadly ride an elephant. I had no idea what the implications were but after spending more and more time in Chiang Mai it now makes sense to head to one of the awesome parks around Chiang Mai and Thailand where you spend time with the elephants, not on them. You must include this on your Chiang Mai itinerary! Pad Thai, Khao Soi, Som Tam, Sticky Rice. That is scraping the surface of Thailand’s amazing food. You’ll eat your fair share, but why not go and do the cooking yourself! 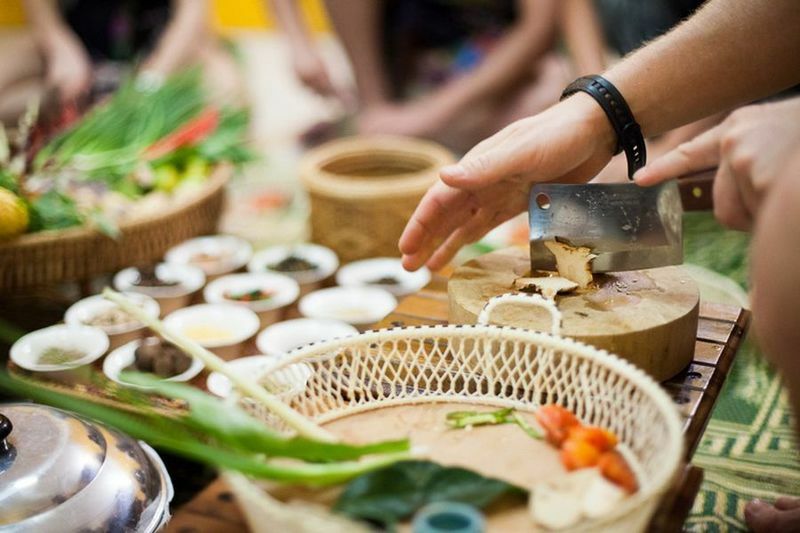 The cooking classes will usually take you to source the ingredients you’ll use before heading to your cooking area. Don’t bother eating before you go to the class, you will be eating all your amazingness on site. Walk around the Old City and have a chat with a few of the tour providers, they’ll let you know what they can provide. 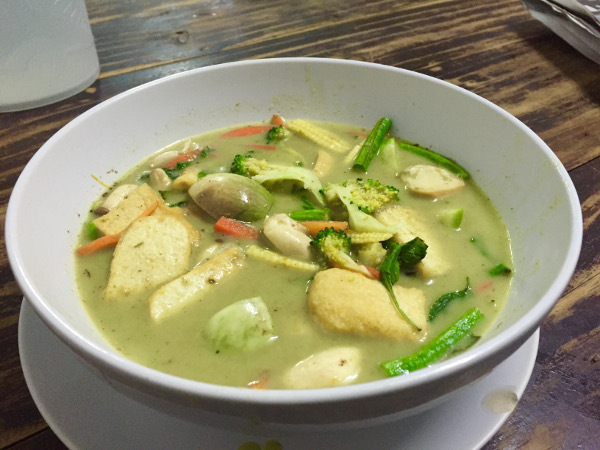 Alternatively, check out the 35 options in Chang Mai on Cookly (May Kaidee is a great vegetarian/vegan option) and book online. Bon Appetit. Thailand is a Buddhist country which to many people who come to Thailand for the first time would not have experienced. Monks are willing to have a chat with you at scheduled times in some of the Wats. From what I recall no topic was too sensitive which, while you should obviously be respectful at all times allows for conversations to go through some interesting twists and turns. We all love to talk about ourselves yea? Could you imagine not talking for 24 hours? 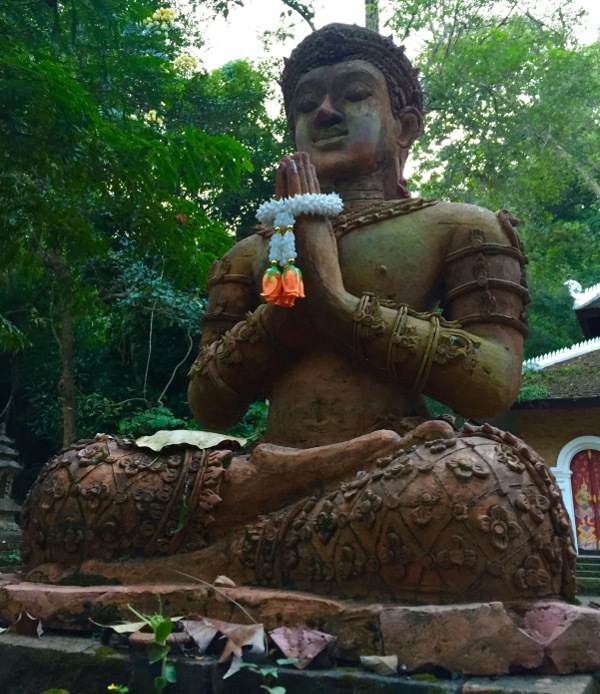 Thailand is known for silent meditation retreats, some go for 30+ days! The best introductory silent meditation in Chiang Mai would have to be the 24 hour one run by Wat Suan Dok each week. Is this possible the hardest of all things to do in Chiang Mai? Documentary Arts Asia is a non-profit working with film and photography and you never know it could be one of the most interesting things to do in Chiang Mai for you. They have a great bunch of staff and they always have something going on from festivals, workshops, screenings and more. I like attending their regular Monday night movie screenings, check out the schedule here. The Tita Gallery is a hidden spot as the art is enveloped in a cafe, where you can grab a bite to eat while you check out the impressive art. The The Museum of World Insects! Don’t let the name throw you off. The insects are actually fascinating and there are lots of other fossilized things to see. Run by a Thai couple, the enthusiasm they have for the insect world is clear as day. The Ganesha Himal Museum is located a few kilometres outside of Chiang Mai which is great as you are probably the only one there. The complex has hundreds of things to look at, with so many colours and architecture from different areas, and a couple pools. You can easily get stuck wandering here for 2+ hours. Doi Suthep is the mountain overlooking Chiang Mai from the west. Near its peak, you will find a viewing platform looking over the city below. There are plenty of market stalls offering souvenirs, food, and drink. If you take a scooter up, continue going up past Doi Suthep and get a nice feed at the village a couple miles further on. Muay Thai is Thailand’s National Sport & people from overseas will often come to train for months at a time. You, however, can attend a single class for a couple hours to see if you have what it takes. You won’t be ready for a fight of course but after getting some cardio and technique training your trainer will let you spar with him for a little bit. I paid 300 baht for a two-hour session. It was a combo of cardio, technique and some fun sparring. A good instructor will understand your ability and cater the session for you. Not, while Get Your Guide has some great deals, their Muay Thai one is highly overpriced for Muay Thai. Book something when you get to the city. I haven’t pulled the trigger yet, mainly out of convenience and planning but I have read all of the blogs about people who have gotten theirs. The tattoo isn’t one that you get on a drunken night out, you should consider it carefully. A simple Google will provide plenty of great stories about their Sak Yant tattoo journey. Both Kristen and Alice show that you can also get the tattoo as a female. 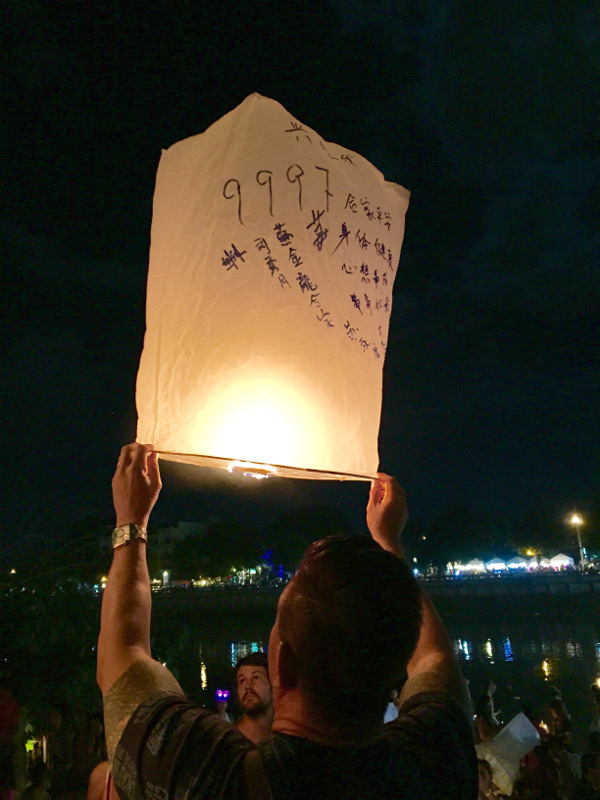 Loi Krathong is the yearly lantern festival in Chiang Mai. It runs around the same time as the Yi Peng festival and if you want the opportunity to see thousands of lanterns lit up and soaring through the sky, this festival is one of the big attractions in Chiang Mai. Celebrating Songkran has been one of my favourite things to do in Chiang Mai in 2013, 2014 and 2015! It’s four days of chaos. Everyone (well there is always a small exception) is in a great mood and having fun. If you are attending Songkran, Chiang Mai is a great place to experience the festival. If you are staying for a minimum of two weeks, you should consider renting an apartment. They can be as cheap as 2,500 baht per month up to 20,000 baht/month. You aren’t likely to get a contract for less than a month but it can be a good solution to rent one for a month anywhere if you are craving some privacy. Easiest way to rent one is to simply walk around and ask about availability when you arrive. A good selection is viewable here and you can view a review of Marina Inn below. This isn’t the easiest of day trips from Chiang Mai, but given the sticky waterfall is getting more populated now, I feel like this is the next hidden place to visit that’ll become popular. The floating pagodas were built in the 2000’s, yet given their location you’d think they’ve been there for a lifetime. I wrote about them here if you want to make a trip to visit them yourself. Zip-lining adventures are popping up all over the world. Chiang Mai has a few of different zip-lining experiences and looking into them on TripAdvisor they get high ratings overall. Zip-lining has become one of the mainstay attractions in Chiang Mai for backpackers here for 2-4 days. Chiang Mai is surrounded by mountains and like any good region with mountains, there’s a variety of camp grounds available. The best app I found for finding campgrounds in Chiang Mai is maps.me. If you don’t have a tent, you can get them at Big C and some Tesco Lotus stores for 300+ baht. Camp a few times in the area and you save money on accommodation and who knows what you’ll discover. 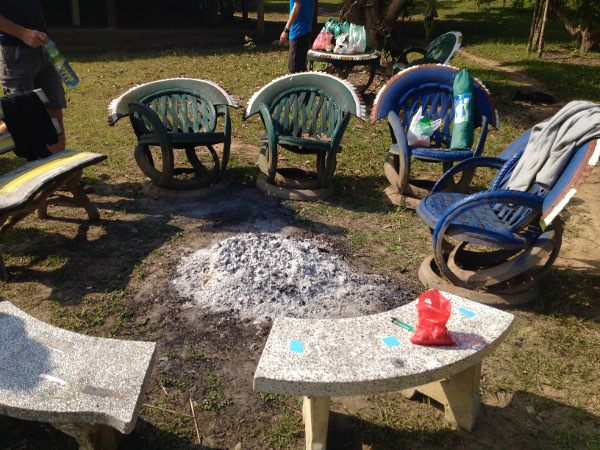 My favourite mission camping in Chiang Mai was in December 2014 to watch the Geminid Meteor Showers. 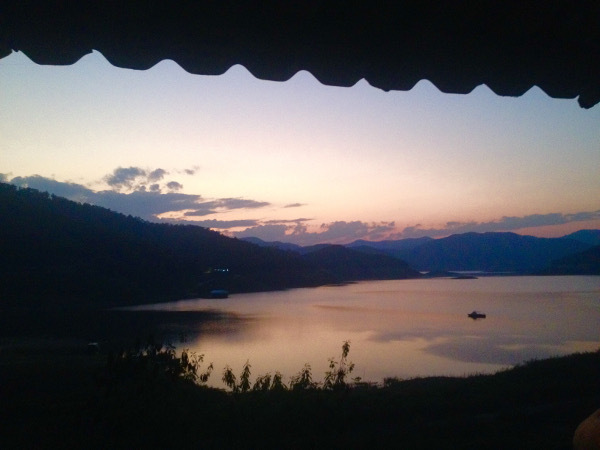 Huay Tung Tao is a man made lake 20 minutes outside the city. You can swim in the lake safely, or hire a pedal boat to float around the lake. 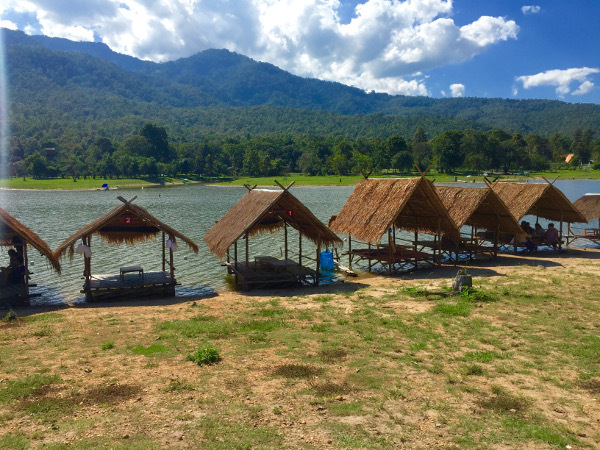 There are tiki huts lining the lake, when you arrive (20 baht entry) choose your hut, order a bit of food and drink and chill out for an afternoon. The easiest way to reach the lake is by scooter, though it is possible to arrange a song thaew if organised in advance. Doi Inthanon has the highest peak in Thailand. Located 70 km, south of the city. 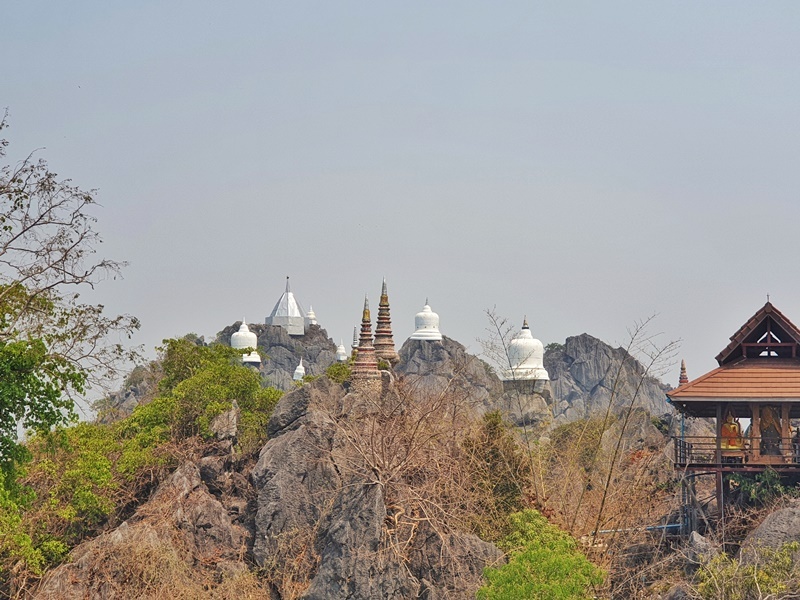 The actual peak is nothing special with no views but there is a beautiful waterfall on the way as well as two epic temples which you will hopefully get a view from. You can take an organized day trip with a company or if you are adventurous make the day trip on your own. Alternatively, you can camp/stay overnight in various places which I highly recommend as it can be a tiring mission there and back in the same day. The Chiang Mai cherry blossoms might not be as spectacular as Japans, but if you keep an eye on the various Chiang Mai forums above, you should be able to quickly arrange a trip up past Doi Suthep to see the Chiang Mai Cherry Blossom trees. 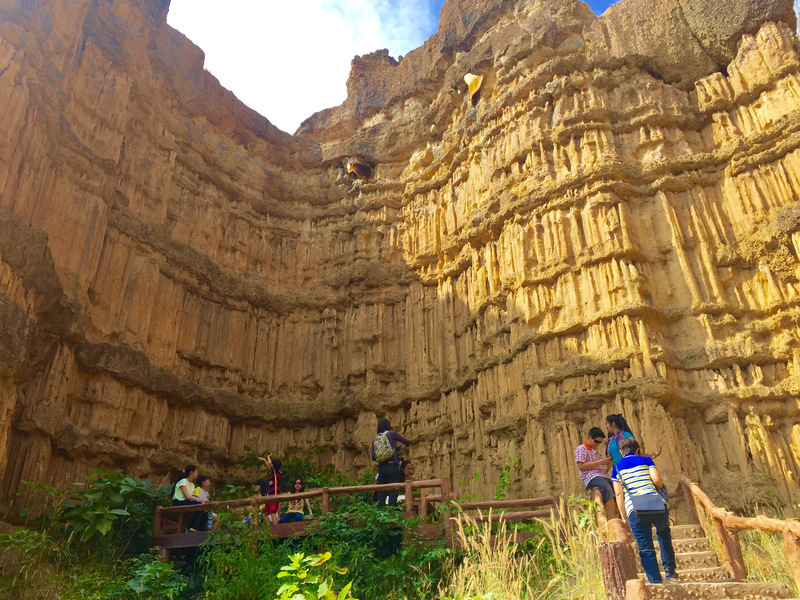 It’s not “the Grand Canyon” but Chiang Mai’s Pha Chor Canyon is right up there near the top when you ponder what to see in Chiang Mai. It a 90-minute drive from the city but is always on the list of places of interest in Chiang Mai for people who think they’ve seen everything nearby. Mae Ngat Dam is located just a few minutes from the Sticky Waterfall and is similar to Huay Tung Thao in that they are just around a lake. The difference is you can actually stay here overnight. I’ve never completed this although it is definitely on my Chiang Mai bucket list. 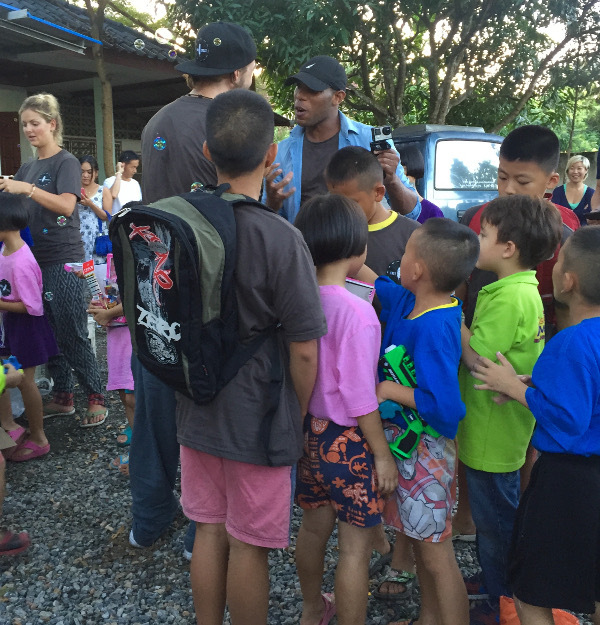 For a trip report you can check out what Tieland To Thailand got up to on their mission. This one was a surprise when I came across it with my friend Delphine. You can reach the park here. While you want necessarily get close to a deer there are a bunch os short walks that instantly take you into nature, transporting you well away from the hustle and bustle of the city. Road safety isn’t exactly spectacular to look at in Chiang Mai but that doesn’t mean you should avoid riding a scooter. With a little common sense you can zoom around on scooters in Chiang Mai starting from 99 baht/day (+ petrol). There’s scooter rental shops all over Chiang Mai, with 99 baht rentals available from here. With a scooter as your transport, suddenly all of these things to do in Chiang Mai are possible. Imagine running straight up a waterfall…sounds pretty crazy right. At the Bua Thong Waterfall however it’s exactly what will find yourself doing. 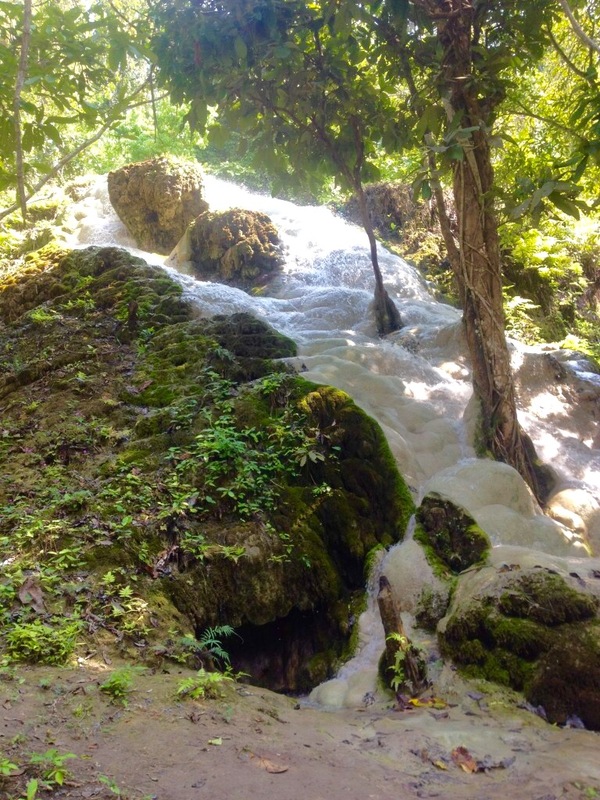 It takes about 60 – 80 minutes from the Old City to get to the sticky waterfall. If you are competent on a scooter it is a must do in Chiang Mai. There are very few tour companies who go there at this stage so it’s not over populated, food & drink is available in the parking area. Ever been to a flower festival? 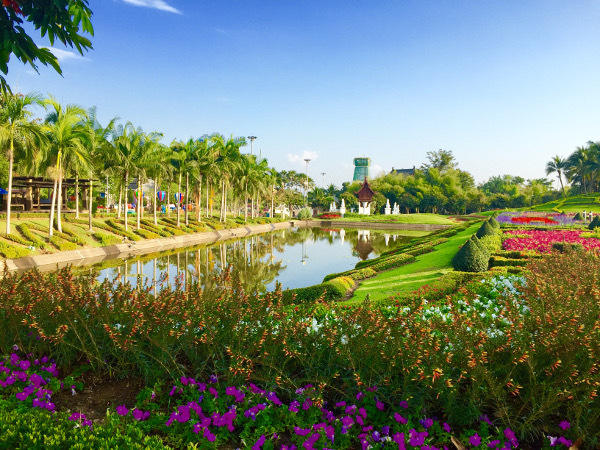 Neither, but you can still check out the grounds where the 2015 Flower Festival is held, a 15 – 20 minute drive from Chiang Mai’s Old City. The grounds are stunning. 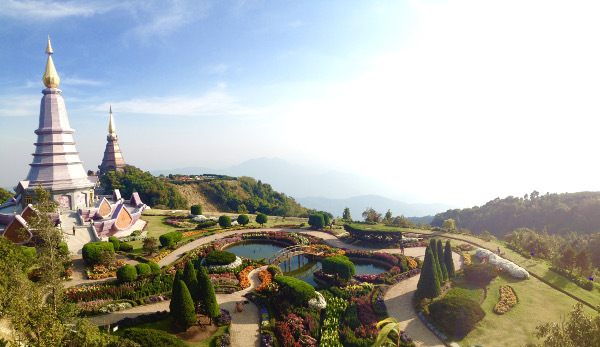 The 100 baht entrance fee is reasonable given they take superb care of the gardens. There’s minimal shade but you can get snacks and water there. 90 minutes is more than enough time to take a stroll from the entrance to the temple and back. This is not realistic if you are only in town for a few days, but if you feel like getting out of town for 4+ days, taking on the Mae Hong Son Loop is from all accounts, epic! The related Wikipedia page has plenty of details to get you started. The Samoeng Loop essentially takes you right around Suthep National Park. The ride can be handled in an afternoon & is suitable for all riders. There are various stops along the way, including cafes and viewpoints for some great photos. The best part about it for me was driving around the corners at speed. The roads are fairly empty for the most part so you never feel in massive danger and the jungle is gorgeous. Chiang Mai is not the best sunset spot in Thailand, that’s putting it politely, especially during burning season. Regardless you can still hashtag your heart out on Instagram in a few spots around the city. Checkout the lake areas at Chiang Mai University, the moat can be a nice spot for some photos from time to time or check out the lake above at Mae Kwong Reservoir. A couple years ago the Chiang Mai Quarry (also called the Grand Canyon) was a hidden gem where expats would hang out. I’ve been a few times and while I’m not a big swimmer but it is still great to hang out there for a couple hours and there is a restaurant looking over the quarry as well. From what I’ve heard, it’s now commercialized (50 baht entry) with a lifeguard present and is quickly becoming one of the popular things to do in Chiang Mai for tourists (you can even book online. I find this interesting as they’ve directly funded the project after seeing how popular it was as a previously free activity. New cafes are opening and other cafes are frequently closing throughout Chiang Mai, particularly the Nimman area. The standard of coffee and food can vary dramatically but with the cost of both so low you can have a great time jumping around a few each day. My personal favourite is The Barn (above) & QQ Cafe, but for coffee fanatics you should pop into RISTR8O. 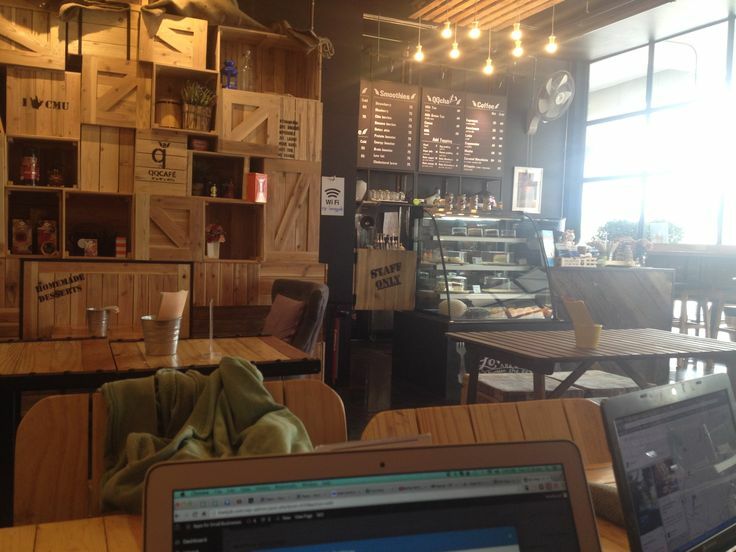 Alternatively, check out this epic list of 50 cafes on the PaperPlanesBlog. Before my first trip to Chiang Mai (Sept. 2012) I somehow stumbled across this article about Ms. Pa and her fruit shakes The first shake was amazing and I’ve had 100+ of her smoothies since (best = mixed fruit, no sugar)..25 baht! 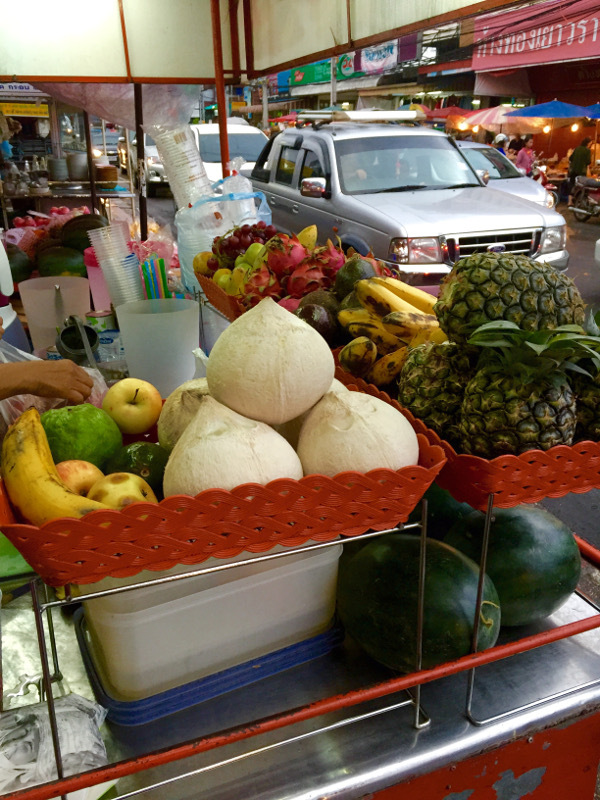 You can find Ms Pa with her cart at Chiang Mai Gate Food Market Monday – Saturday. If you get there after 9pm, prepare to be disappointed as she could well be sold out. Every second Wednesday Leoni brings together tourists, locals and expats together to cook up a meal at a local orphanage. If you can’t cook you can help the kids with their English. Even if you can’t cook (guilty) someone has to peel the vegetables, regardless it’s one of the most rewarding things to do in Chiang Mai. To find out when the next cooking event is, check out the Couchsurfing Events page. Cafes based on coffee are not unusual. Coming across a tea house is a lot rarer, but of course, Chiang Mai offers a few. Tianzi, they serve the elusive puer tea which made me happy and are all about natural products and seeking wealth from the earth. Sati – the art of tea and yoga, offers a tea ceremony which I just missed out on. Fortunately, you know this festival won’t be like the infamous China tea scam as Mrs. Echo is one of the nicest people you will meet. The Pink Tea House on the Ping River is the most recognisable tea house in Chiang Mai. The more classy decor is ideal for your date and is a very nice dining experience. You don’t come to Chiang Mai for the nightlife, at time of writing places are closing at midnight, 1 a.m. at the latest. The backpackers club scene is based on Zoe’s which has a bunch of other clubs in the immediate area blasting various tunes. For more clubs, head to the Nimman area (Warm Up) and the other side of Ping River. Despite the early night finish there is no shortage of bars & pubs in and around the Old City. 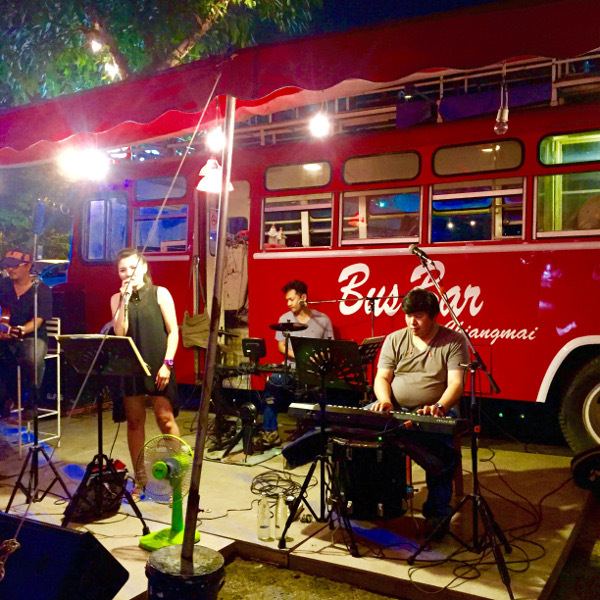 As mentioned below, Bus Bar is one of my favourites as is THC Bar near Thaepae gate and Bla Bla Bar in Nimman. 1 Stop Chiang Mai has a great list to get you started, otherwise just get exploring and walk into anywhere that looks and sounds exciting to you. Note: Drinking Chang at Bus Bar Wednesday may cause Changnesia. Wednesday trip report from Andy. Bus Bar is a great bar (when it’s not raining). It’s located right alongside the Ping River with a good view of the colourful lights on the iron gate bridge. There are live music most nights but at a sound where you can hear what is being said across the table from you. On Wednesdays, there is a Couch Surfing meetup held by a long time local (depending on who is in town). It is a great way to make friends and I still pop back regularly! Who doesn’t want a buffet of beer. There are several beer buffets in the Nimman area but they’re known to come and go at any time. The general theory is you pay 200 – 400 baht, choose your beverage of Chang, Leo or Singha and you then get continuous refills for two hours. Yup, it really is a all you can drink buffet. You can also find a wine buffet in Chiang Mai. For 199 baht you can spend one hour (starting any time they’re open) of day drinking all the box wine you want (At Wine Lover, Nimman). If you are prone to food rather than alcohol, there are plenty of buffets in Chiang Mai. A good starter list can be found here. ***In December 2015, Rush Bar was no longer offering the beer buffet to Foreigners. As a vegan I probably shouldn’t be condoning this, but if you are an omnivore try at least one toastie from 7/11. The theorem is that they are pretty darn tasty. 7/11 is also your chance to bask in the a/c, get some snacks and generally is a source of happiness. Chiang Mai definitely looks after the foodie. Regardless of you diet there are plenty of restaurants for everyone. There are also restaurants specialising in worldly cuisines popping up more and more. For vegan & vegetarian restaurants in Chiang Mai, check out this link and link (one of my favourites is Imm Aim). For a more general list, simply check out the latest top restaurants on TripAdvisor. Located on Huay Kaew Road just past the Canal Road intersection you’ll find Catmosphere. 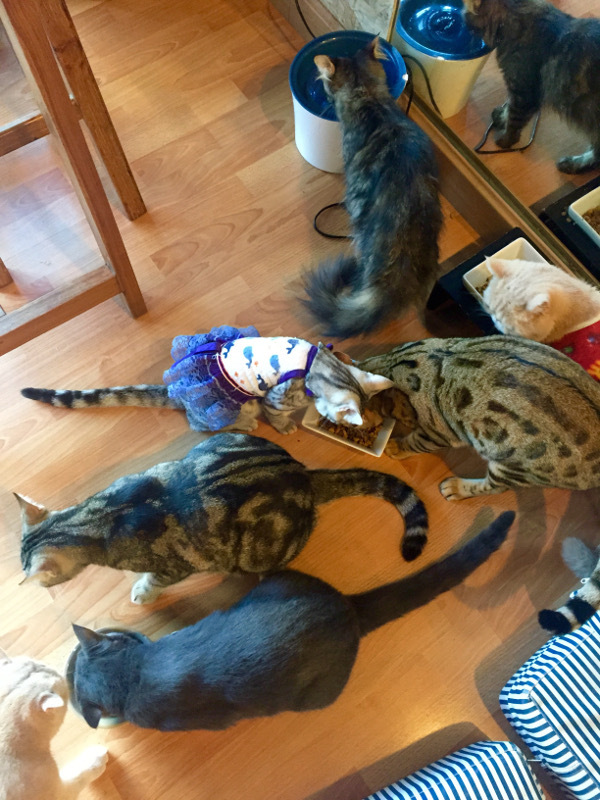 The Cat Cafe is open from 10am – 8pm 7 days a week. It isn’t the largest cafe so be prepared for a bit of a wait if you go on a weekend. Catmosphere is more intimate than the cat cafes in Bangkok and Melbourne. The staff are nice, and the cats were reasonably active mid-afternoon. If dogs are more your thing and you are in Chiang Mai for a couple weeks, check out Care for Dogs. It’s a beautiful park too! 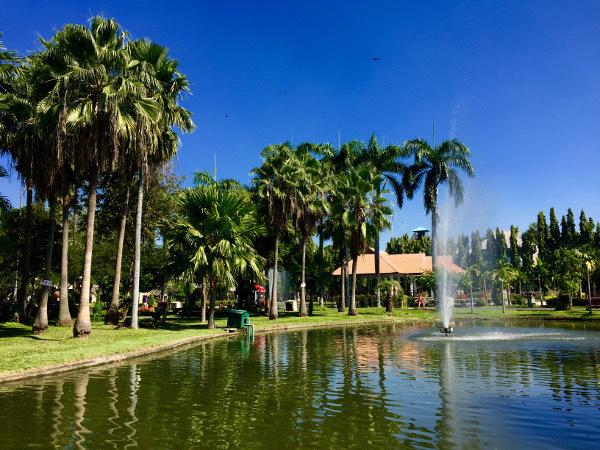 Immediately on the inside of the Southwest corner of the moat you will find Buak Had Park. It’s a great wee park where you can get some exercise or simply enjoy some epic people-watching. There is even pickleball played on Monday, Wednesday and Friday mornings. If you head there late in the afternoon, you will likely find various people slacklining, juggling, getting their acro yoga & all sorts of fun. Simply head over, say hi and join in. A great way to spend time and it is one of the free things to do in Chiang Mai that you won’t feel guilty for not tipping at all. Thailand is football crazy. Like New Zealand, it’s crazy popular but it doesn’t mean they’re good as a nation. Regardless, it’s a fun evening to go check out a game if you happen to be in town (Schedule). The home games Chiang Mai play are at the 700-year-old stadium. Tickets are insanely cheap, 120 baht will get you prime seats. A Thai massage is something most people look forward to in Thailand, in part because of their reputation and the price with some as cheap as 150 baht/hour. I’m one of the few who doesn’t seem to enjoy a Thai Massage. I feel like I’ve been beaten up after a massage, but that doesn’t mean you shouldn’t get one. Look up various places online for those with a good reputation as the quality varies significantly. Expect to pay 200 – 300 baht/hour. You can also get any other massage variant or even take massage classes which can be found all around the old city. 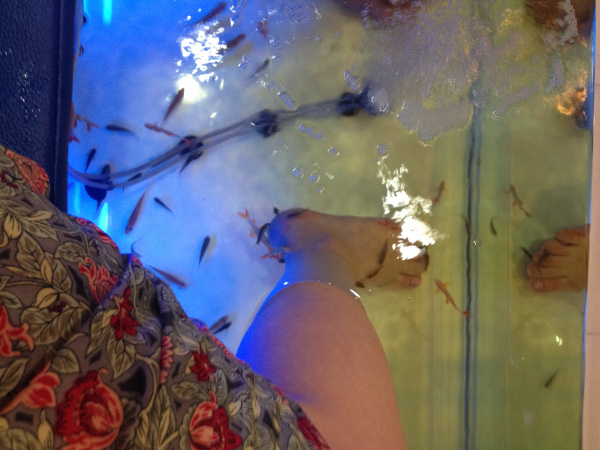 Fish Spa To Clean Your Feet? The fish wine and dine on your dead skin. Yum. A weird concept! You simply pop your feet in the water and the fish are attracted to your skin as the take a munch on the dead skin of your feet. It tickles at first, but your feet really feel so good afterward! Win. You can find a fish spa in Chiang Mai all hours of the day. The spa doesn’t take long so just go to one when you come across one. Considering the temperature never ever gets close to zero it is rather confusing to think you can go ice skating in Chiang Mai. At Chiang Mais Festival Mall you can! The skating rink is actually ice, and they offer skates and entrance fee for 200 – 400baht depending on the day and group size. This is the only place I’ve ever ice skated and it was a blast. The air temperature is warm so there is no need to wrap up warm, and when it’s located in a large mall you can satisfy your hunger right after. Such a great gimmick idea! Thailand is fast becoming a golf destination and you can get a taste of golf in Chiang Mai just metres from the Southwest corner of the moat. There is a driving range, and a golf course offering night golf (under lights) which is something different for most. If you are into Jazz at all, the North Gate Jazz Club is the place to be. I have been here 10 or so times and it’s always great to meet people though if you don’t like crowded/loud bars it might be worth giving it a miss. There are more open mic nights around the city, often changing so a quick Google/asking in Facebook groups (below) is your best bet. If you decide to take on the tubing, you’ll get picked up near Tha Phae Gate and driven 45 – 60 minutes outside of town to an isolated location on the river with a massive (fake) beach. The tubing itself takes 1 – 3 hours depending on how many stops you take (and the number of beers you drink). Afterwards, you can chill out as much as you like at the ‘beach’, playing volleyball, football or whatever you like. The team is great and you can check out more on their website. This isn’t the cheapest activity in Chiang Mai with the tubing (including pick up and drop off) costing 600 baht, plus the beers/food you buy there are marked up significantly. It’s a spectacular day though, the Vang Vieng of Thailand? If you are from Aussie, New Zealand, America etc. you know it costs you a small fortune every time you go to the cinema. Luckily in Chiang Mai you can head to the cinema in any of the malls and see the latest movies for a few dollars. You can watch movies in 4D at Central Festival or on Wednesdays head to Maya Mall and watch movies for half price, 100 – 150 baht. There are all VIP experiences & IMAX theatres available. Download the app and have fun! Let’s be honest, we all like looking cool in photos. Art In Paradise is a 3D Museum where you can interact with over 130 paintings transporting you to a bunch of different scenes making it one of the best things to do in Thailand. Check out the website gallery for inspiration and book your tickets in advance. Not sure if it is a festival really, but anyway TedX Chiang Mai is a fun day if you ever watch TED videos. You can find out details about the event here (tickets sell fast). Chiang Mai cops very well with the level of tourism year round and has no shortage of accommodation options to please all. You can check out endless options on Booking.com which I find has the cheapest prices compared to the other hotel websites. Dorm rooms start from as low as 80 baht (when I last looked in March 2018). There are airbnb properties in Chiang Mai too, but in general I’ve found them a bit overpriced compared to what you pay for a hotel. There are some great options though. Each to their own. Looking for along term apartment? Your best bet is to simply arrive and start walking around the area you want to stay in and asking about availability anytime you see something you like. Most of the time, you won’t struggle with availability unless you arrive in the high season, December/January. Well there you go, that took quite a long time to put together as I was thinking back over my time in Chiang Mai for the last few years. This isn’t a simple list of the best attractions in Chiang Mai. If you have been to Chiang Mai before, you can probably find a couple things that I didn’t get on the list. But I’m pretty sure there will be at least a couple new things you hadn’t thought of in this great city, even if it isn’t for everyone. Free PDF Checklist: Don’t forget, you can download a list of all these activities. Click here, no email required. What do you think are the best things to do in Chiang Mai? Comment below! ARE YOU PUMPED UP? SAVE THIS TO YOUR PINTEREST TRAVEL BOARD! Hey, this is a great list. I have been living in CM for about 2 years now. 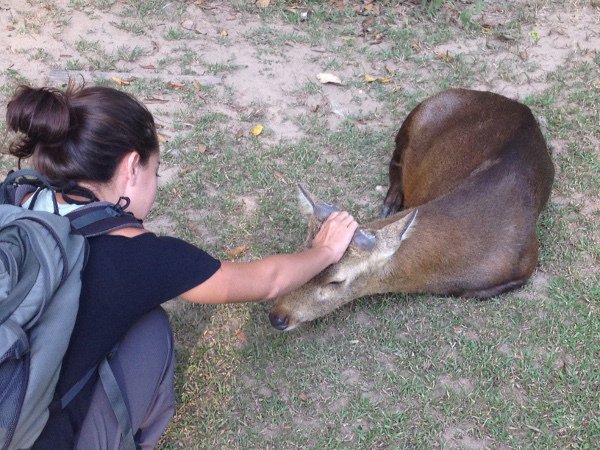 I have done most of the things, but I would love to pet the deers. I noticed that the link to the place is not there. Can you update it for me please? Thanks! Thanks for the question, the GPS coordinates are: 18.781482,98.9467923 . The link has been updated above. Have fun with the Bambi’s! Hi I’m going to Chang Mia for 5 days in November on my own as a female is it safe? Wow, you are really selling this place to me. I need to visit Chiang Mai one day and discover this other side of Thailand. Thanks for the share! I have been living in Chiang Mai for over 15 years and still love reading posts like these. When you stay too long you fail to notice what is going on around you. This is essentially the best list for CM I’ve read! Thanks, Jub! I attempted to go to sticky waterfall a few times but the weather was hating on me. And love the food there. Khao niao, many many more. I doubt there would be public buses. You don’t sound confident about the bikes, don’t risk it (if you do, make sure you’ve got the right travel insurance). I would also like to add the Roitawarabarn Baandhawalai. It’s a house that’s full of intricate arts. The admission is free and I usually go there whenever I’m in Chiang Mai because that house is so stunning plus you can also see the artist while they’re working on their masterpiece. Nice list Jub! I have done a few. The cat cafe was fun. Just strolling around the Old City with a banana shake in hand works fine for me. Such a fun way to enjoy Chiang Mai. You’re right. I want a banana shake right about now. Temperatures are hot and sticky in KL atm. Great guide though I probably would leave out the Quarry. Swimming in old Quarries hosts a whole host of health risks. Heavy metals in the water, limestone, machinery, sharp rocks…not the best advice in my opinion. Otherwise a great and insightful guide. Thanks! Heyya, yea the quarries can be a bit dodgy. Especially that one, but it appears they’ve put procedures in place for safety….whatever that means haha.